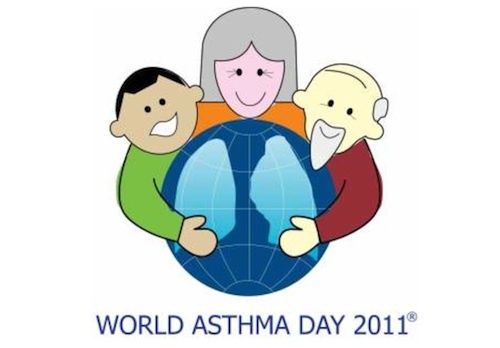 World Asthma Day is an annual event organized by the Global Initiative for Asthma (GINA). The event raises awareness about asthma and works to improve asthma care around the world. This year’s theme is “You Can Control Your Asthma”. It aims to continue the focus on asthma control described in the latest version of the GINA guidelines . Special considerations in relation to various health conditions such as pregnancy, obesity, surgery, sinusitis, etc. Today, GINA is also launching the next phase in a five-year Asthma Control Challenge that began last year on World Asthma Day 2010 . GINA has challenged healthcare providers around the world to cut asthma-related hospitalizations in half by 2015 by improving asthma control. The new phase of the challenge includes an online data collection system that will be a powerful tool for countries around the world to track their progress in reducing hospitalizations. Although World Asthma Day only runs one day, May is also National Asthma and Allergy Awareness Month. It’s a peak season for asthma and allergy sufferers, and a perfect time to educate everyone about these diseases. Asthma is a chronic inflammatory disorder of the airways characterized by mild to life-threatening episodes of airway narrowing and obstruction, which causes wheezing, coughing, chest tightness and shortness of breath. It affects more than 17 million American adults and 7 million children under 18 years of age. According to WHO estimates, 235 million people worldwide suffer from asthma . Asthma is the most common chronic disease among children. Rates of asthma have risen sharply over the past thirty years, particularly among children ages 5 to 14. Asthma disproportionately affects minorities, people with lower incomes, females, and children. The strongest risk factors for developing asthma are exposure to indoor allergens such as house dust mites in bedding, carpets and stuffed furniture; pollution and pet dander; outdoor allergens such as pollens and moulds; tobacco smoke and chemical irritants in the workplace. Asthma triggers can include cold air, extreme emotional arousal such as anger or fear, and physical exercise. Asthma is often under-diagnosed and under-treated, creating a substantial burden to individuals and families and possibly restricting individuals’ activities for a lifetime. Although there is no cure for asthma, daily preventive treatment plans according to individual symptoms can enable people to manage their symptoms and lead active lives. The National Institute of Environmental Health Sciences (NIEHS), the National Heart, Lung, and Blood Institute (NHLBI), and the National Institute of Allergy and Infectious Diseases (NIAID) all work to advance studies that will help improve asthma prevention, diagnosis and management. Although each institute focuses on a fundamentally different aspect of asthma, they work closely together to coordinate research programs and provide a critical foundation for improving outcomes for patients with asthma. As the lead NIH institute focusing on how environmental factors impact human health, the National Institute of Environmental Health Sciences (NIEHS) is working to understand how exposures to environmental agents trigger diseases such as asthma, and these diseases can be prevented, diagnosed and treated. Additionally, the NIEHS is developing and testing new technologies to help determine environmental triggers and reduce asthma symptoms. The NIEHS is also supporting research to find improved asthma interventions. By working closely with other NIH-funded researchers and international collaborators to conduct genome-wide association studies, NIEHS researchers continue to learn more about genetic susceptibility to asthma. The studies are aimed at identifying genetic risk factors and their interactions with environmental risk factors to characterize how they may influence susceptibility to the disease. The National Heart, Lung, and Blood Institute (NHLBI) supports a broad asthma research program that spans basic research, genomics, proteomics, epidemiology, clinical trials and demonstration projects. This support has advanced our understanding of the mechanisms of asthma and improved patient care. Several current NHLBI research programs are addressing the problem of recurrent asthma flare-ups in people with otherwise good day-to-day asthma control, including a study of new treatment approaches for flare-ups in infants and school-age children, as well as genome-wide association studies investigating the genetic factors that make some patients prone to worsening of asthma symptoms. The NHLBI will soon launch a network of six clinical centers that will integrate molecular, cellular and clinical studies of severe asthma to better predict when serious complications of asthma will occur and identify new targets for therapy. The National Institute of Allergy and Infectious Diseases (NIAID) program in asthma research focuses on understanding how allergens, pollutants, infections and genetics interact with the immune system to cause and aggravate asthma. It also centers on developing strategies to treat and prevent the disease. NIAID funds three multi-site asthma clinical research programs and many individual grants in support of these efforts. NIAID-funded researchers have greatly increased our understanding of asthma by studying inner-city children, who are at a disproportionately high risk for the disease. Major efforts are under way to understand how viral infections can worsen asthma, and how obesity may affect the disease. In the area of treatment, a recent NIAID-sponsored clinical trial found that augmenting NIH asthma guidelines-based therapy with a drug that targets immunoglobulin E, an antibody that plays a key role in allergy, nearly eliminated seasonal increases in asthma attacks and significantly decreased asthma symptoms among inner-city youth. The NIAID, NHLBI, and several other NIH institutes, together with the Agency for Healthcare Research and Quality and the Merck Childhood Asthma Network, co-sponsored the Asthma Outcomes Workshop in March 2010 to develop standardized definitions and data collection methods for asthma clinical studies. These standards will enable investigators to better compare results across studies and better inform the direction of future research. The March 2010 workshop participants reached consensus on seven key outcome measures that will be required in future NIH-sponsored asthma clinical trials and observational studies: symptoms, exacerbations, biomarkers, lung function, quality of life, asthma control questionnaire results and healthcare utilization and cost. The workshop report will be published in the Journal of Allergy and Clinical Immunology in fall 2011. The The World Asthma Foundation is dedicated to educational resources for the asthma treatment and asthma management including what causes asthma, asthma symptoms, astham attacks and asthma treatment options. The Asthma and Allergy Foundation of America provides free information and resources for people with allergies and asthma. The Centers for Disease Control and Prevention (CDC) asthma site covers asthma facts, asthma triggers and control of asthma, and includes information for specific groups, data & surveillance, and the CDC’s National Asthma Control Program. Asthma at the U.S. Environmental Protection Agency (EPA) offers information on the EPA’s asthma program, basic information on asthma, community outreach and supporting science. The AsthmaCommunityNetwork.org is designed for community-based asthma programs and organizations that sponsor them, including representatives of health plans and providers, government health and environmental agencies, nonprofits, coalitions, schools and more. GINA Report, Global Strategy for Asthma Management and Prevention. Global Initiative for Asthma (GINA). Updated 2010. Asthma Control Challenge Backgrounder 2011. Global Initiative for Asthma (GINA). Accessed 2011 May 3. 10 facts on asthma. World Health Organization. May 2011.